About 6 years ago, my husband & “kids” (then ages 23 & 29 at the time, daughter & son, respectively) were coming back from some concert in Millennium Park (or Grant Park?) and a young Mennonite woman (late teens, I’d guess) greeted me (I guess it was obvious I was the “Mom”) and handed me a brochure about Menonnite beliefs & Christianity in general. She was dressed fairly plan, though no prayer cap. I saw a few other plainly dressed young people in the general area—male & female. I wonder how common it is for this kind of thing—even by Mennonnites—evangelizing in a big city, handing out brochures. Do any of the more liberal Amish groups ever do it, Erik? One thing that sets Amish apart from many Christian denominations is their reluctance to vocally promote their faith. Amish feel drawn to a quiet witness. The authors of The Amish Way explain Amish thoughts on winning over souls: “In publications, sermons, and daily conversations, Amish people emphasize the importance of “letting our light shine,” but as one man said, “not shining it in the eyes of other people” (The Amish Way, p. 42). One qualified exception are the New Order churches, which do some things we might consider more “vocal”. Ohio-based Amish Brotherhood publications produces a number of pamphlets and books dealing with faith. I’ve received these on a couple of occasions from New Order church members. One better-known tract, first published in 1983, is titled The Truth in Word and Work: A Statement of Faith by Ministers and Brethren of Amish Churches of Holmes Co., Ohio and Related Areas. More aggressive efforts such as what Alice Mary describes are not something you’d see, however. As for traveling beyond Amish areas, charity and mission relief work is accepted, and common among not just the New Order Amish. Old Order Amish as well are active in disaster relief and other efforts such as meat-packing for food donations, organized through CAM (Christian Aid Ministries) and other charities. A good description of some of these activities among the Holmes County, Ohio Amish can be found in the book An Amish Paradox. Amish relief workers did not expect to convert others to the Amish way through such brief contact, even if their work was deeply appreciated. Their service was an end to itself, not an effort to proselytize. In fact, some Amish view the notion of seeking converts to one’s own church as prideful. They hope that their Christian witness will lead others to deepen or renew their own faith rather than become Amish (The Amish Way, pp. 43-44). 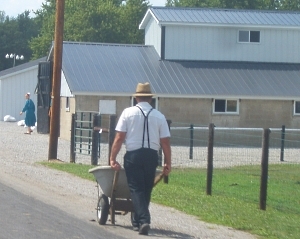 23 responses to Do Amish evangelize? It’s been my experience, as an Anglican in ministry, that the sermons we preach with our lives speak louder than the sermons we preach with our mouths. Some of the more mainstreamed Mennonite churches do some evangelism, but certainly not along the lines of the churches we call Evangelist, which are based on the teachings of John Calvin. Mennonite/Amish churches are Anabaptist, and and are from a different line of Protestantism. I am of the opinion that the groups who declared themselves Anabaptist and emerged under the guidance of Menno Simons existed apart from official Catholicism before the Reformation. They may have been an isolated Orthodox church that did not acknowledge the Roman authority. You’ve mentioned the possible Orthodox/Mennonite connection before – do you have any facts to back this up? It’s certain intriguing and plausible – especially the further east one would go. My understanding was that Menno Simons was originally a Catholic Priest. Anabaptists did seem to predate Menno Simons. The gal I talked to (this might not be true of all of the evangelizers) at Lollapalooza was Mennonite. Its almost exclusively young women, and they pass out fliers. They are pretty unobtrusive and cool to talk too, compared to some of the other groups who show up with loudspeakers telling you that rock music is of satan. I tell you if you want to stick out at a music festival amongst the wild clothes, hair and tattoos dress Amish! This post reminded me of something. One of my Mennonite friends in high school’s dad would go to Mardi GRAS nearly every year with a few other people with a giant cross and pass out tracts. I could be wrong but the impression I got from my friend was that his dad took it upon himself to do this rather than the church sponsoring is activity. That may be true of the people who come out for Lollapalooza. Nearly all Amish or Mennonite young women who are obviously dressed plain would also be wearing a veiling of some kind. My suggestion would be that she was somewhat ashamed of her plainness and the most obvious part of that form of dress, the veiling, could easily be discarded for the public activity. If so, she was in a state of confusion herself. On the other hand, some of the churches associated with Charity Christian Fellowship in Ephrata, Pa. have attempted to minimize some of the so-called legalism associated with their former Amish or Mennonite fellowships. I just read a post somewhere else that suggested wearing of the veiling 24/7 was still very much a part of their normal practice, but this is the only plain group I am aware of where going without a veiling might be possible. Osiah, not sure I understand your wording. Wearing a veil in public is still very much a part of “Charity Churches.” Although there may be some who consider themselves part of that movement who wouldn’t, they are the exception, not the rule. On another note … youtube has videos of Mennonites evangelizing in NYC. VArious conservative groups here in the east regularly take day trips into the bigger cities to evangelize. Just a few weeks ago the Eastern (or Pilgim Mennonites, cant say which group for sure) held a conference on evangelism in Massachusetts, in which part of the conference was hands on witnessing in Boston I think it was. Interestingly, the early Anabaptists were very evangelistic. George Blaurock is remembered for taking over the pulpit in one church, and they preached publicly in the markets when persecution wasnt real strong. Otherwise it was in the forests, caves, and shuttered rooms, but they baptized thousands even though in some places rebaptism carried the death penalty. The Hutterites used to send out missionaries 2 by 2 every Spring and Fall, who went all over GErman-speaking Europe. Within a few decades the colonies numbered about 50,000 people, obviously they got most of their converts from the outside, since they started with a handful. The lack of aggressive evangelism in conservative Anabaptist groups is something that has done a 180 degree since their beginning days 5 centuries ago. Our church conference (conservative Mennonite) sometimes participates in street evangelism in DC or NYC. Plain dress would be expected. Our church has limited participation, in part due to the distance we would have to travel. I personally do not participate in that sort of endevor because I feel it is more effective for me to witness in our home community through the work that can be done locally. Working with the local food ministry, volunteering at the homeless shelter, helping and sharing with our neighbors,all these are activities we can do that help act as living testimonies to God’s love and mercy. If I were in DC doing street evangelism, and someone came to me and earnestly desired to be saved and join a church, I could pray for him, but where would I send him to be part of a body of believers? I know next to nothing about DC. Although I am Roman Catholic, I have a great respect and affinity for the Anabaptist (Amish and Mennonite) way. Their witness to faith is indeed lived out for others to see: it is an unobtrusive, gentle witness. It draws me to their faith community and builds my respect for them. Other churches, whose members are loud and use psychological manipulation to coerce people into line, have zero respect with me. Anabaptist humility is a respectful humility. Yes their humility is amazing but they don’t have the Eucharist (I think). We (Anabaptists) have Communion instead of the Eucharist. It is similar, but we believe it is an Ordinance (a symbolic ritual that recalls a spiritual truth) rather than the real body and blood of Christ. I think you are correct, Forest. It seems that the Amish see evangelism as arrogant. I was born and raised Amish and lived the Amish lifestyle for over 40 years. We left the Amish about 8 years ago. I cna not understand why the last commandment that Jesus gave His followers before He assented to heaven could be tridden underfoot. Example; A recently ordained Amish minister had a sign on his mailbox that read,’Jesus is the only way to heaven.’ The church was offended and insisted he remove the sign…. or else. Not sure what ‘or else’ meant. He removed the sign and some time later he had another sign in its place. That sign was advertising various kinds of dogs… this was acceptable to the church. Therefore, I had to stop in and pay him a visit. Hhmmm. Van loads of Old Order Amish of several areas in Indiana, are in Bluffton ,Indiana this week , getting packages ready for the prisoners for a Seventh Day Adventist, prison ministry team,,,,,, and some churches in the Michichigan Circle have gone todo some prison ministry too…. I purchased produce on a regular basis at the Amish farm market in St. Mary’s, MD this summer. I dress plain (long skirt, t-shirt, bandana-type head covering) and a older Amish gentleman asked what church I attended. I told him we were between churches, but had one we were hoping to start attending, and he gently admonished me to go ahead and attend church. Since he was old enough to be my grandfather, it did not seem arrogant, as other experiences with evangelists can seem. In fact, I appreciated that he cared. In general, I have found the Amish in St. Mary’s to be fairly outgoing and conversational. I have enjoyed making some connections in that community. I agree with what others have said, that actions, leading by example, and demonstrating humility are more effective than vocal witness. In my history book about the early Anabaptists, in particular Mennonites-they were referred to as the “Evangelical Anabaptists”-they were radical & passed out tracts in their beginnings, the early reformation days. I have met Amish that pass out tracts & I appreciate that they step out of their comfort zone to do so. After all, Romans 10:14,15 says “How then shall they call on Him in who they have not believed? and how shall they believe in Him of whom they have not heard? and how shall they hear without a preacher? And how shall they preach, except they be sent? as it is written, how beautiful are the feet of them that preach the Gospel of peace, and bring glad tidings of good things!” Both ways are essential, of being salt & light-I’m thankful to hear they’re returning to recognizing this. I would be surprised to see Amish or Mennonites openly evangelizing. I always assumed they preferred to let their lives be the example of Jesus Christ to the world 🙂 This is a really interesting article. That is true Heather. Jesus lived it AND He spoke it. He is our example in Word & Deed. Here where I live, the Amish are not evangelistic – ALTHOUGH you are seeing some of them become a little more open with others in discussing things. Interestingly, there are “religious” signs all over the place alongside the roads, and some of these are at Amish homes. I think as with most things Amish it just depends upon the groups whether they are comfortable with this and if it is allowed. The Mennonites around here are generally “evangelistic” but to varying degrees depending on how conservative they are. Some are less outward about it, other plain and covering Mennonites actually go door to door to leave tracts on porches and in doors. Sometimes I think people from out of the area get confused, too, as there are many of what we always called “mod” Mennonites who are not plain and are considered locally a bit on the liberal side, if you will. They are very open about evangelizing and it always seems to throw people off who didn’t grow up here to find out that they are Mennonite when some of them look like fashion models, :D! The Amish (overall) see themselves as those that need to sweep their own house rather than sweeping someone else’s house. There is always work to be done in my own heart, or those of my family. Many will apply the words of Jesus to pull the beam from our own eye so we can see better to cast out the mote in a brother’s eye. There certainly are exceptions to the above view. There are Amish that will share their testimonies- on the street, in prison, or wherever it may be. They love the Lord and truly desire to do all they can to help others find the truth. I do have a concern that the thought of ‘just letting our light shine’ is in stark contrast to Jesus’ last commandment before His assention. To go and preach and teach ALL things that I have commanded you… does that only mean people in our own congregation? Valerie, to answer your question honestly…”They don’t have much of a burden for the lost except for those that were members of the Amish church and are excommunicated, and also those that have left the Amish church. That oftentimes is a heartbreaker for many of Amish. I spent the weekend with a Beachy group (my first visit to a Mennonite church) and Sunday evening before church, I was invited to go out singing hymns in a nursing home nearby with the church youth. It was an interesting experience and I felt blessed to go along. There was no preaching or passing out tracts, but I would consider it a form of evangelism. Beachy, I understand are probably more evangelistically-minded than a lot of conservative Anabaptists. But like other conservative groups, evangelism takes less the form of preaching and more serving. Just talked today with a New, New Order Amish man, who lives in the Walhonding,Ohio community,,,and they took a Charter bus load of young people to pass out Gospel CDs on the streets of New York City…. I have known some menonites that dont wear hair coverings .They dress like everyone else for most part an that they do lots of mission activitys an work . They do believe women shldnt wear jeans or other items that are considerd mens clothing. Leave a reply to Do Amish evangelize?